Hey!! I have just managed to run remote desktop from ubuntu 7.10 to windows XP through a VPN. "pptpd" and "pptp-linux", pptpd is the microsoft protocol for Point to point Tunneling protocol, this plug in to the network manager will allow to to set up the vpn client. vpnc plug in to the network manager will allow to start the connection and the connection. once install you can establish the vpn connection and it will be ready for the remote desktop. On the option choose RDP or RDPv5 also filling the IP address of your Windows XP box. The only problem I got now is my slow and unreliable broadband connection. I have a poor 500K/s with talk talk, I should go back to BT but the price is double. 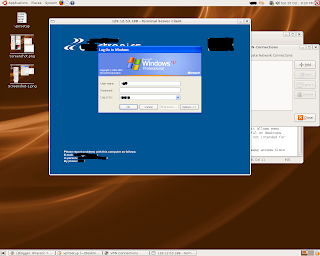 TightVNC as the server on window and the "Terminal Server Client" (using VNC for the protocol option) on the remote linux box works perfectly.